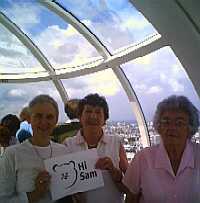 Hi Sam from a high place! Last week my sister Mary (aka Big Mod) and my aunts Maureen and Phylis, came over from Ireland to London to visit. One of the highlights of their visit was a ‘flight’ on the London Eye – in the photo we’re at the very top, which has to be the highest you can be in London without getting on a plane. Better still, we had VIP tickets so we didn’t have to queue! This is me on holiday in Spain. I had a great time with my family there, including my young nephew and neice who spent every minute they could in the swimming pool you can just see over my left shoulder. It was always freezing cold to get into but warmed up when you splashed about! It also had a beautiful mosaic of a dolphin on the bottom. 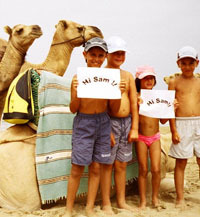 These are my children and their cousins in a very hot and sun drenched beach in Morocco. We wished that you could have joined us! You would have loved riding high on the camels hump!! 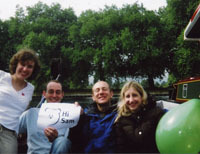 Hi Sam from the Thames! These are my friends on a birthday boat trip near Windsor. The weather was very rainy and very sunny! We had to have our picnic on the boat as it was too rainy to get out at lunchtime! Hello, my name is Arlo and I am 15 months old. 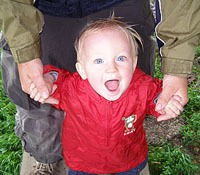 My friends and I have just learnt to walk and we are going to be doing a sponsored walk along the river in Kendal to raise money for Sam at the end of September (date dependent on weather!). Here I am in training, on a very rainy walk with my Daddy! Anyway, while wandering around the web I came across a site by Crazy Musher, a fellow dog sledder who raised money for the Scot Polar Research Institute. His team followed the exact same route we did just after our team, he also had the ingenious idea of taking a BBC reporter along with him who put together the following news story about the trip from BBC Look East. Were those groans at the back?! Yes, the festive period is here again! Despite it being August Harrods opened their Christmas decorations department last week…(honestly they really did) so to get you in the mood, here is news of our Christmas plans. 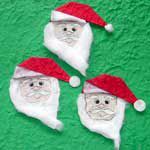 We’re planning a crafts4sam Christmas sale some time before, well, Christmas! We thought we’d mention it now as we don’t actually have a single thing to sell and need your help! We’re hoping to sell home made handcrafts, cakes and presents made by anyone who wants to contribute. So if you’re a knitter, sewer, quilter, baker, candle stick or card maker or dabble in something else that is weird and wonderful then we’d love for you to get involved. This particular sale will take place in London but if you want to run your own sale anywhere else that would also be great – the more the better! And don’t forget to keep an eye out here for updates! Can you be more adventurous than a ferry across the channel? Can you be sillier than the chaps? Can you be somewhere more glamorous than Budapest? Can you be cooler than a cow at the Big Chill? 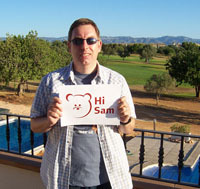 See the Hi Sam messages archive for inspiration! 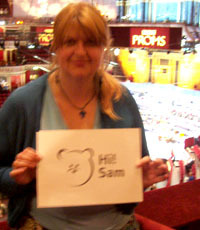 This is (a blurry) me at the Royal Albert Hall, home of the BBC Proms! I am perched on the edge of the RNIB box after hearing some exciting music. The orchestra played very loud as the conductor waved his baton and we all clapped madly at the end. I was very high up and I was a little bit worried about falling over the edge! Thank you to Barbara Shephard and Pam Goodliffe! Big thank you to Barbara Shephard who has been making home made cards and present bags to add to the book sale. The cards include birthday, new baby and wedding cards and are also available in tactile and popup versions. It’s hardly surprising that they’ve been going like hot cakes!